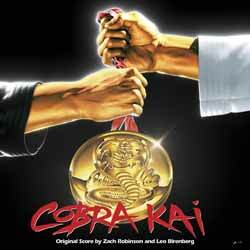 Leo Birenberg and Zach Robinson's score for Cobra Kai not only pays homage to the original movie, by delivering a number of retro sounding themes, it also incorporates some interesting modern segments of music. The score is thematically split into three areas (three unique score worlds that each support a different story being told on the show). Johnny's music is the representation of how he hears himself: as the ultimate badass, scored with face-melting guitar riffs and bruising arena drums; Daniel La Russo’s theme is supported by more orchestral, Japanese-influenced sounds; and his tonal palette connects us to the earlier films and Bill Conti's score. Overall, it's an engaging and very enjoyable score - helped greatly by its diversity and thematically rich palette. Even if you're not a huge fan of the show, there's enough quality material here to make it at least worth checking out.